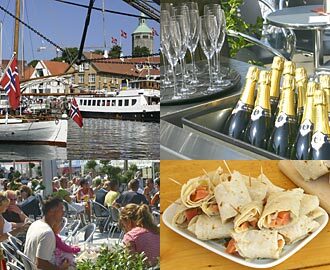 Gladmat in Stavanger was a great success again in 2006. Held from Wednesday 26th to Saturday 29th July, this food festival was blessed with good warm weather, and tens of thousands of visitors. More of the stalls are being imaginative with the food on offer, and the trend to showcase new restaurants before they open continues. Gladmat has come a long way since the first festival seven years ago. It isn't just that the crowds of visitors are bigger (although they are) this year saw a continuing trend of some of the best exhibitors showcasing - and selling - really good specialist food, with good wine to go with it. a few stalls were offering small tasters for 5 kroner - a great idea at a festival where you might want to sample a lot of tastes and styles. Much better than having to buy a complete meal at one place. One example is shown in the picture - pickled salmon wrapped in lefse, which is a bit like a tortilla or a pancake. Extreme Dinners was reckoned to be a great gastronomic experience. It was disappointing that so few places offered any vegetarian options (we could only see Sala Thai), although there was no shortage of seafood on offer. There were also too many places still just serving grilled chicken, pølser (sausage, not always very good) spare ribs and similar. Following in the footsteps of Tango (which previewed at Gladmat in 2003), this year saw Pushkin Bar and Restaurant showing off some of their Russian dishes, ahead of their opening in early August.